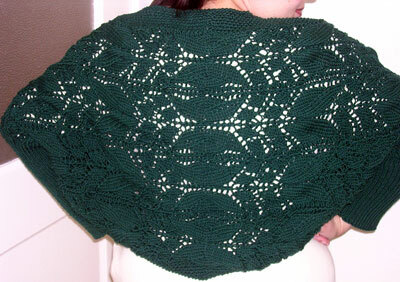 Yes, I do knit—and finish things! And I pose in such completely uncharming ways. I always think I’m posing with a rueful mockery of Twyla Tharp dance moves, but instead I just look kinda lame. And what shows off my fabulous dance moves than than my delightful nightgown. Stand back Kate Moss–heroine chic is so 1994. The millenium fashion is all about grandma chic. But more importantly, it is proof that I do finish objects. 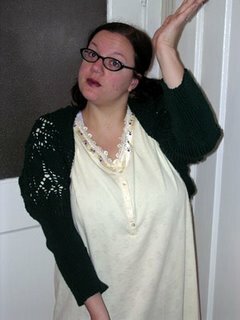 My delight Lanz nightgown in cream does show off the back lace pattern which hooked me into making this shrug in the first place. Check out the glamour here. Oh and even included a shoulder shot. Very dramatic, no? I must say that this is my first shrug and I initially wanted to have it finished before I went into the hospital so I could keep myself warm without getting bogged down by all of the extra fabric of a sweater in bed. Nice thought, eh? Well, in reality I didn’t even finish one pattern repeat before I went in, but cranked on it to finish it afterwards in less than a week. I think I’ll bring it to work and hang it on my chair, and when people ask me about it, I can spin around innocently and bat my eyes at them as I tell them I made it—truly, I did! I knit this clever shrug with 10 balls of Karabella dark green 100 percent merino wool and it only had INCHES left of yarn by the time I knit the last stitch. I’m sure it’s just riddled with boo-boos aplenty, but I’ll just blame any mistakes I find in it on the Vicodine. But alas that’s not all—I will be posting MORE finished objects this week. A little thing I like to call Elizabeth Beeton… You’ll see. I think it’s ravishing! 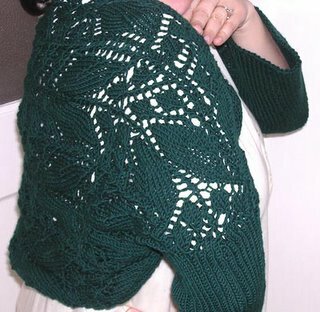 And right now I’m working on that Sweet Mary Jane sweater that you see the picture of below and I knit an inch on before the holidays and then completely forgot about. And that’s not all—I will stitch up those baby devil pants this week too. I know—Too. Much. Excitement. For. One. Day!